I have analysed the important properties of both models such as ensuring residuals are close to a white noise process and so on but am unsure which of the above 2 models is most suitable for forecasting purposes and why? Also I am unsure how to compute forecast for the trend component vector if I use the classical decomposition model $X_t = T_t + S_t +N_t$. Is it even possible to create forecasts using this type of model? As regards the comparison of models, the idea proposed by @forecaster can be helpful since you have a relatively long series. 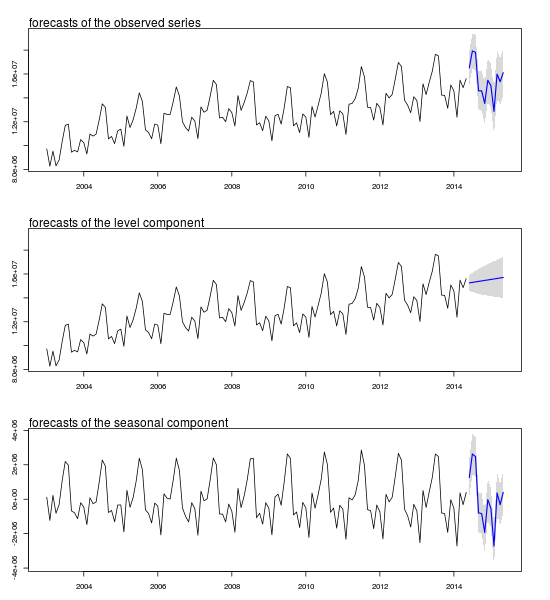 Regarding your last question about how to obtain forecasts for the trend component rather than for the whole series: as far as I know there is no package on CRAN that decomposes a fitted ARIMA model into a trend and seasonal component. The package ArDec decomposes a series based on autoregressions but I don't think it is straightforward to apply it to an ARIMA model. Your idea of decomposing the series by means of moving averages could be a solution. As you are interested in forecasting the trend component, it would be better to fit an ARIMA model to the trend component rather than to the noise component $N_t$ and then obtain forecasts based on this model. However, this may not be an efficient approach since you work with a smoothed version of the data instead of using the observed data. The function predict can be used to obtain forecasts, predict(fit1), but forecasts are returned for the observed series, not for the components. To obtain forecasts of the components based on a structural model you can use the package stsm. require("stsm.class") # this package will be merged into package "stsm"
The parameters var1, var2, var3 and var4 are referred respectively to the variances of the disturbance term in the observation equation and in the level, slope and seasonal components. 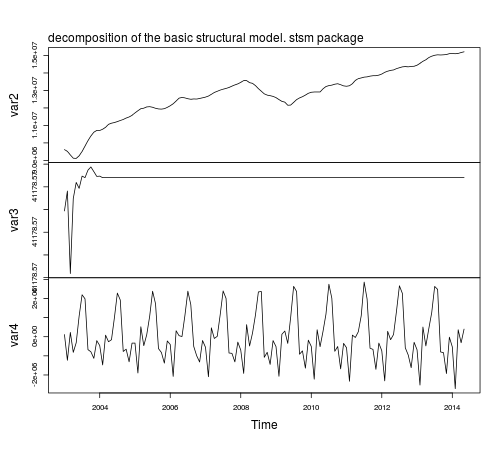 Notice that the parameter estimates based on StructTS and stsm are the same, however, the estimated components look better in the latter case compared to those based on StructTS: the trend component is smoother with no fluctuations at the beginning of the sample and the variance of the seasonal component is more stable throughout time. The reason for this difference in the plots is that stsm uses P0cov = FALSE (a diagonal covariance matrix for the initial state vector, but this is a topic for another post). Not the answer you're looking for? Browse other questions tagged r time-series forecasting arima autocorrelation or ask your own question. predict seasonality and trend combined, better approach? 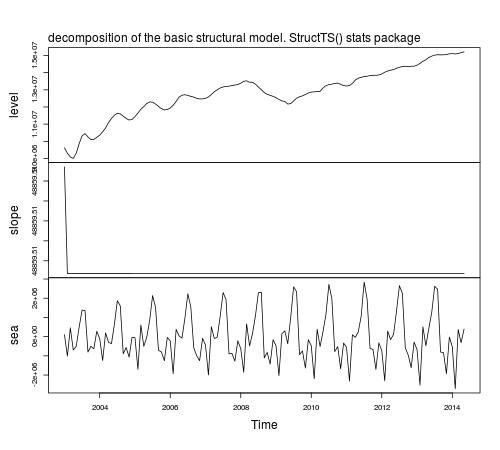 Should I use a seasonal arima or stl decomposition and model residuals only? Metric to evaluate accuracy of time series decomposition?